But that is what Anne Gros and her husband Jean Paul Tollot have done. 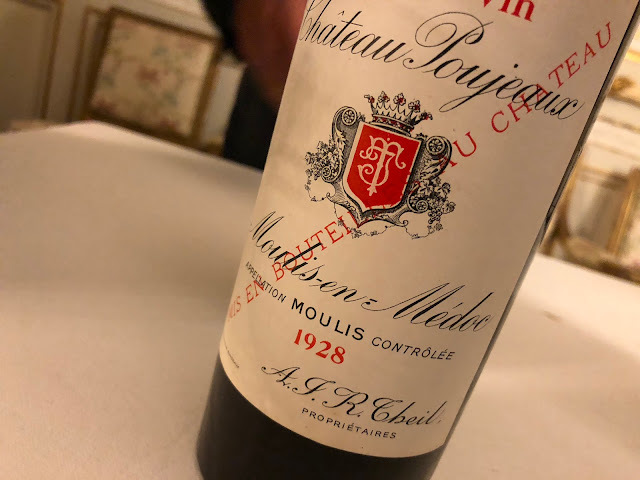 Having established reputations in Burgundy, they were looking for a new adventure and were considering purchasing a vineyard in the south of France. They came to the tiny hamlet of Cazelles in the Minervois, bordering on St. Chinian, and it was love at first sight. A brand new winery was built in 2008, now sitting on 16 hectares of vines ranging from 5 years to more than 100 years old. Modern, high-tech equipment is used, including three different sized tractors, since the oldest vines are so narrowly planted that not even a quad can pass between them. I spend part of spring/summer in Roquebrun, and Cazelles is only a half hour drive away, passing through several different landscapes and the beautiful medieval village of Minerve, perched on an enormous gorge. And this is what I love about the Languedoc, the variety of astonishingly different regions and terroirs within such a short distance. 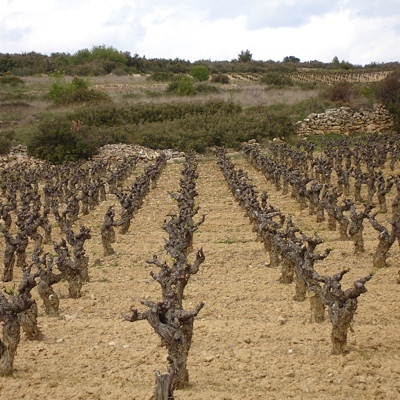 The soils of Roquebrun in the mountains are largely composed of shales, both red and black. Heading into St. Chinian on the plain, these shales are complemented by reddish clays. From Minerve, you begin the steady climb, zig-zagging your way along the small highway until you arrive on the plateau of the Minervois itself, just before St. Jean de Minervois, and suddenly you are blinded by the brilliant white limestones so typical of the region, with its millions and millions of jagged stones. Unfortunately, neither Anne nor Jean Paul were at the domain at the time of our visit, but no problem: we were greeted by the very knowledgeable and friendly chef de culture, Thibaut Bernabeu. We jumped into a jeep and for the next two hours, Thibaut gave us a very extensive tour of the variegated plots. There is an amazing variety of soils here. On the north side of the winery, they are composed largely of sandstone with mixed pebbles and stones. These are small plots surrounded by garrigues of scrubland bush and fragrant herbs, with occasional pine trees. The vines here are younger, roughly 20 year old Grenache and Syrah, 40 year old Cinsault and Carignan ranging from 30 to 45 years. These vines are used to produce the wines La 50/50 (which receives no wood ageing) and Les Fontanilles (only some wood ageing). Upon crossing to the southern side of the winery, you might think you’ve arrived in a different country. Here the blinding white limestones on top of clay resembles a lunar landscape, and must indeed be brilliant under moonlight. Millions of rocks are strewn about with an occasional oak tree to provide shade. The stones absorb heat, which allows the clay to remain fresh, and this is important in this particularly hot region where drought can be a problem. Some of the vines here are over a hundred years old. The grapes grown here find their way into the top wines La Ciaude (Syrah, Carignan and Grenache) and Les Carrétals (principally old Carignan). 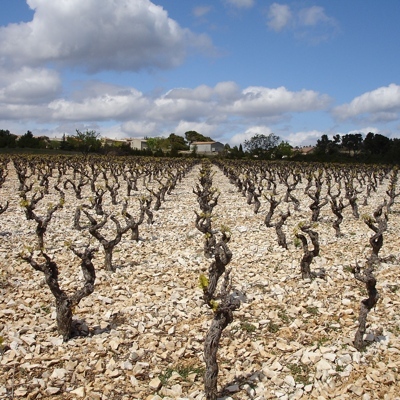 All wines fall under the Minervois appellation. What followed was an extremely interesting tasting, as they were all samples from barriques which are meant for blending. The 2011 Cinsault from the Fontenilles plot (an experiment, not normally put in barrel) had both power and elegance, rich dark fruits and woody tannins. I have never tasted Cinsault like this before. The 2011 Carignan from different plots at Les Fontenilles was so Carignan, and I say this as a lover of the grape. Very dark berries, more coarse and with a barnyard component. The 2011 Syrah from Fontenilles had blue and black berries, spicey with a lighter texture, very fruit driven. You taste here very pure fruit, this would make a wonderful cépage wine, no doubt the result of the producer, more Burgundian than Languedoc in nature. Finally, a sample of the 2011 Carignan (100 year old vines) from Carrétal. A bit of gunsmoke in the nose, and an explosive fruit character. The 2011 is a refined Carignan, wonderful really. It was a pleasure to visit this domain and taste these yet to be blended wines, particularly fascinating because they are made by Burgundians, truly expressing their own vision in the Languedoc.